The Volkswagen Scirocco is a three-door, four passenger (2+2), front-engine, front wheel drive sport coupé manufactured and marketed by Volkswagen in two generations from 1974 to 1992 and a third generation from 2008 until 2017. Production ended without a successor. There is also a one of a kind MK2 Scirocco Ute build called Olive that can be found on carthrottle website. The Scirocco derives its name from the Mediterranean wind. The design of the vehicle combined with the lack of US D.O.T. approved rectangular headlights, made it necessary to have four round headlights, two for low beam use and two for high beam use for all the cars imported to USA. However, the European "TS" version, for which maximum power was listed as 85 PS (84 hp; 63 kW), was easily distinguishable from the less powerful "L" and "S" (50 and 70 PS) versions which came with just two rectangular headlights. An automatic transmission option was added in January 1975. Automatic transmission-equipped Sciroccos were generally rare outside of North America. The Scirocco was sold in Japan at Yanase dealerships that specialize in North American and European vehicles with right hand drive starting in 1976, initially offering the TS trim package with the 1.4L engine and a 4-speed manual transmission. In 1977, the GTE and LS were offered with the 1.5L engine and the fuel injection technology from Bosch. The GTE was available with either the 4-speed manual transmission or the 3-speed automatic, while the LS offered the automatic only. Sales of the Scirocco continued for this entire generation to Japanese buyers, and it was in compliance with Japanese Government dimension regulations which helped sales. The engines offered to Japanese buyers were the smaller displacement versions to reduce the annual Japanese road tax obligation. The car changed little before being replaced by the second generation in March 1981 (Europe). However, air conditioning became available as an option on the domestic market in August 1975. The possibility to retrofit the installation, together with a larger battery, was offered to existing owners. During the production of the "Type 53", there were subtle changes to the body and trim. On cars produced after the summer break in August 1975 (for the 1976 model year), the conventional two wiper system changed to a single wiper which parks on the passenger side of the windscreen, while the driver also benefited from improved, lighter, steering linkage. In August 1977 (for model year 1978) the separate front side marker and turn signal, changed to a combination wrap-around orange lens. At the same time, behind the doors the B-pillar colour changed from body colour to black, which was thought to give the car a more pleasing profile. Other mid-life changes include the move from chrome bumpers with rubberised end caps to a plastic-coated one-piece wrap around bumper. In 1979, the one-piece "flag" style outside mirrors transitioned to a two-piece shrouded mirror. There were also special variants throughout the Type 1 production. Most distinguishable by paint schemes and trim, there were special versions called "Sidewinder", "Sidewinder II", "Champagne Edition", "Champagne Edition II" and the "S". The Champagne Edition II only came in white with black accents and a Zender front spoiler. On the NA models the 1980 "S" versions came in only three colours, Alpine White, Black and Mars Red with unique colour accents. This "S" model differed from the base model by having blacked out chrome trim, day glow additions to the exterior trim, Recaro designed sports seats, white letter tires, sport strips and a standard five-speed transmission. This was followed by the 1981 "S" versions which only came in Cosmos Silver Metallic, Cirrus Gray Metallic and Mars Red without the colour accents. Steel sunroofs were an available option on both the "S" non-"S" vehicles. Unlike the sunroofs on the second-generation Sciroccos introduced in 1982, these earlier versions only tilted open. They did not slide back but could be removed and stored in a special fabric folder and placed in the trunk hatch. Not forgetting the addition of the "Storm" models, available in two colours with a run of 250 cars in each colour. The 1975-1978 model year USA vehicles had four-speed manual transmissions; for the 1979-1980 model years, USA vehicles were offered a five-speed manual transmissions as an option. In 1981 the five-speed became standard. The engine option was mostly limited to one, although it changed frequently over the years. The 1975 models are 1.5 L (1471 cc), followed by a larger 1.6 with 76 hp (57 kW) in 1976 and 1977. For 1978 Volkswagen reverted to a short-stroke 1.5 (now of 1457 cc), stating that this made meeting emissions requirements easier. Power dropped accordingly, down to 71 hp (53 kW) but with some fuel economy improvements. Buyers demanded otherwise and for 1979 the 1.6 (1588 cc) was reinstated, now with power up somewhat to 78 hp (58 kW). 1981 USA models had a standard 1.7 (1,715 cc), all featuring a single-overhead camshaft and two valves per cylinder. A heavily redesigned "Type 2" variant (internally designated Typ 53B) went on sale in 1981, although it remained on the A1 platform. 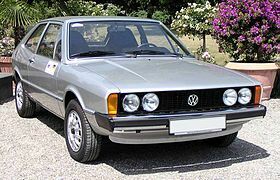 The second generation Scirocco, still assembled on behalf of Volkswagen by Karmann of Osnabrück (in the same factory as the first generation Scirocco), was first shown at the 1981 Geneva Motor Show in March that year. Designed by Volkswagen's own internal design team, the new car featured increased front and rear headroom, increased luggage space and a reduction in the coefficient of drag. One feature of the Type 2 was the location of the rear spoiler midway up the glass on the rear hatch. A mid-cycle update occurred in 1984, which included minor changes over the 1982 model: removal of the outlined "SCIROCCO" script from the rear hatch (below the spoiler), a redesigned air conditioning compressor, and a different brake master cylinder with in-line proportioning valves and a brake light switch mounted to the pedal instead of on the master cylinder. Halfway through the 1984 model year, a new space-saver spare wheel was added, that provided room for a larger fuel tank (with a second "transfer" fuel pump). Leather interior, power windows and mirrors, air conditioning, and a manual sunroof were options for all years. The 1984 model year saw the return of two windshield wipers (vs the large single wiper), absent since the 1976 models. Eleven different engines were offered in the Type 2 Scirocco over the production run, although not all engines were available in all markets. These engines included both carburetor and fuel injection engines. Initially all models had eight-valve engines. A 16-valve head was developed by tuner Oettinger in 1981, with the modification adopted by Volkswagen when they showed a multi-valve Scirocco at the 1983 Frankfurt Motor Show. It went on sale in Germany and a few other markets in July 1985, with a catalyzed model arriving in 1986. Displacements ranged from 1.3 liters up to 1.8 liters. Power ranged from 44 kW (60 PS) to 82 kW (112 PS) for the 8 valve engines and either 95 kW (129 PS) or 102 kW (139 PS) for the 16 valve engines. Numerous trim levels existed, depending on the model year and market, and included the L, CL, GL, LS, GLS, GLI, GT, GTI, GTL, GTS, GTX, GT II, Scala, GT 16V and GTX 16V. Special limited edition models including the White Cat (Europe), Tropic (Europe), Storm (UK), Slegato (Canada), and Wolfsburg Edition (USA and Canada) were also produced. These special models typically featured unique interior/exterior color combinations, special alloy wheels and had special combinations of options such as leather, multifunction trip computer and/or power windows as standard. Scirocco sales continued until 1992 in Germany, the UK, and some other European markets. The Scirocco was briefly joined but effectively replaced by the Corrado in the VW line-up, although this had been on sale since 1988 and was aimed further upmarket. The Scirocco continued to be offered to Japanese buyers, but only the GTi with the 1.8 L engine in either manual or automatic transmissions, but starting with 1986 only the automatic transmission was offered. It did continue to comply with Japanese Government dimension regulations. Specifications in North America are somewhat different from those of cars sold in the rest of the world, due to the differing safety and emissions regulations in place there. In North America, 1982 and 1983 models produce 74 hp (55 kW) and 90 ft⋅lbf (122 N⋅m) of torque. The engine code was EN. The 1984 models produce 90 hp (67 kW) and 100 ft⋅lbf (136 N⋅m) of torque, the engine code was JH. In mid-1986, a 16-valve model was released in the United States and Canada, which included a full body skirt, larger rear spoiler, and tear-drop shaped wheel slots to distinguish it from Type 2 8-valve models. Sales continued until 1988 in the United States, 1989 in Canada, being effectively replaced in these markets by the more expensive Corrado. Volkswagen officially announced in June 2006 production of a new Scirocco model at the AutoEuropa assembly plant in Palmela, Portugal. The new model, identified by the internal type numbers 137 or 1K8, is based on the PQ35 platform of the Golf V and was unveiled at the 2008 Geneva Motor Show. It went on sale in summer 2008 in Europe, with sales in other countries beginning early 2009. The Type 3 Scirocco won "Car of the Year 2008" from Top Gear Magazine. Adult Occupant 87%, 31 points. Child Occupant 73%, 36 points. Safety Assist 71%, 5 points. The Scirocco R is a production model based on the GT24. Its 1,984 cc (2.0 L) FSI inline-four engine is rated at 265 PS (195 kW; 261 hp) at 6,000 rpm and 350 N⋅m (258 lb⋅ft) of torque at 2,500 rpm, large air intake openings in the front bumper, an integrated front spoiler, bi-xenon headlights, larger rear roof edge spoiler, black diffuser, dual exhaust with chrome tailpipes, Talladega 18-inch alloy wheels. In September 2014 the R model had a face lift on the styling of the car and a power increase taking it to 276 hp (280 PS; 206 kW). UK models went on sale in 2009. Six years after its launch in 2008, Volkswagen revealed the 2014 Scirocco face-lift at the Geneva Motor Show. The car received alterations to keep the model fresh for approximately three years. On the outside the changes aren't very obvious as Volkswagen installed only a slightly re-profiled bumper, new bi-xenon headlights with LED daytime running lights and they also tweaked the grille. At the back there are restyled LED taillights, along with a reworked bumper and boot lid. These changes carry over onto the range-topping Scirocco R as well. All models include standard six-speed manual transmission. The 1.4 TSI (162 PS) can optionally be fitted with a seven-speed DSG transmission, while the 2.0 TSI 200, 2.0 TSI 210, R 2.0 TSI 265 and 2.0 TDI are available with a six-speed DSG transmission. The EA888 2.0 TSI uses an IHI K03 water-cooled turbocharger incorporated in exhaust manifold, while a BorgWarner turbocharger is used in EA113 2.0 TSI versions. In the 24 Hours Nürburgring in May 2008, three new Volkswagen Scirocco did very well in the field of over 200, among them many high powered cars, finishing 11th and 15th, with veteran Hans-Joachim Stuck driving both cars (and Carlos Sainz the slower one). The direct competitors, two Opel Astra H GTC driven by drivers selected from 18,000 hopefuls in a year-long TV covered process, were beaten decisively. In the 2012 edition of the Scandinavian Touring Car Championship Johan Kristoffersson won the championship for Volkswagen Team Biogas in a Scirocco. In April 2007, Volkswagen America vice president Adrian Hallmark claimed that Volkswagen preferred not to bring the Scirocco to North America since it could negatively affect Golf GTI sales. It was later stated that the final decision would be made in 2008 by Martin Winterkorn (Volkswagen's CEO), not Volkswagen of America. In early March 2008, MotorAuthority reported that, due to the increasing gap between the United States dollar and the Euro, the Scirocco would not be made available for American consumers. "This car would fit the U.S. market but at the current exchange rate we wouldn't make any money," Volkswagen sales and marketing chief Detlef Wittig told Bloomberg reporters. A concept car previewing the then upcoming Scirocco III was unveiled at the 2006 Paris Motor Show. Named IROC, from the middle four letters of "Scirocco", it used a 200 hp (149 kW) TSI engine. The Scirocco GT24 is a race car for the 24-hour race at the Nürburgring. It has a 2.0 L TSI engine rated at 325 PS (239 kW; 321 hp) and 340 N⋅m (251 lb⋅ft) at 2,100 rpm as well as a DSG transmission. The GT24 was unveiled at the GTI Meet 2008 in Wörthersee. The Studie R is a concept car based on the Scirocco GT24, after Volkswagen had cancelled the production of the Scirocco R32. It has a 2.0 L TSI engine rated at 270 PS (199 kW; 266 hp), six-speed dual clutch transmission, four-piston brake calipers and a sound-optimized exhaust system with oval, polished tailpipes. The Studie R was unveiled at the Bologna Motor Show. ^ a b c d "Autotest: Volkswagen Scirocco TS". Autocar. Vol. 145 no. 4161. 1976-08-07. pp. 6–10. ^ "Scirocco Timeline". Sciroccoregisterforum.co.uk. 2010-07-23. Retrieved 2010-10-09. ^ a b "Nachrichten aus der Technik: Klimaanlage für VW Golf und Scirocco (Technical news: air conditioning for VW Golf and Scirocco)". Auto Motor u. Sport. Vol. Heft 18 1975. 30 August 1975. pp. Seite 36. ^ Böhler, Claudia.Scirocco.Wolfsburg 2008. ISBN 978-3-935112-33-8. ^ "Neuer VW Scirocco kommt aus Portugal" [New VW Scirocco to come from Portugal] (in German). Handelsblatt. June 20, 2006. ^ "VW Scirocco | Euro NCAP – For safer cars crash test safety rating". Euro NCAP. Retrieved 2011-04-08. ^ Nunez, Alex (2009-05-20). "Officially Official: Volkswagen Scirocco R". Autoblog.com. Retrieved 2010-10-09. ^ "New 265 PS Scirocco 'R' set to make its public debut". 2009-05-20. Retrieved 2009-05-22. ^ "2014 Volkswagen Scirocco facelift unveiled with a series of cosmetic and engine updates". Motor1.com. Retrieved 2015-11-12. ^ "Volkswagen won't bring Scirocco to the U.S." Motor Trend. April 2007. ^ "Report: Scirocco may still come to America". leftlanenews. May 2007. ^ Neff, John (2006-08-24). "VW IROC Concept unveiled!". Autoblog.com. Retrieved 2010-10-09. ^ Horrell, Paul (2006-11-01). "VW will IROC you: No, it's not what you're thinking". www.motortrend.com. Retrieved 26 November 2009. ^ Joseph, Noah (2008-05-22). "Volkswagen Scirocco GT24 debuts at Wörthersee". Autoblog.com. Retrieved 2010-10-09. ^ Lavrinc, Damon (2008-11-25). "Volkswagen dropping Scirocco R32 in favor of Scirocco R20T". Autoblog.com. Retrieved 2010-10-09. ^ Roth, Dan (2008-12-03). "VW shows off Scirocco Study R in Bologna". Autoblog.com. Retrieved 2010-10-09. ^ "VW Scirocco Study R revealed in Bologna". Worldcarfans.com. Retrieved 2010-10-09. Wikimedia Commons has media related to Volkswagen Scirocco.